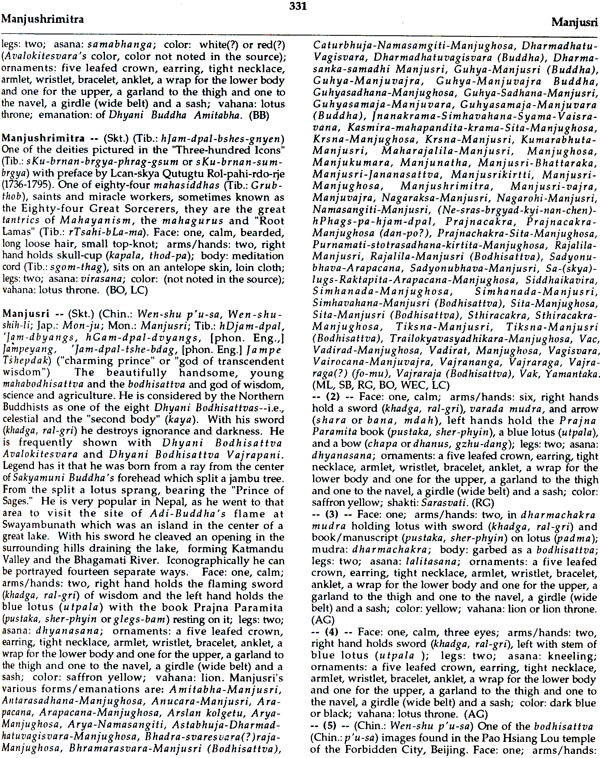 Beginning with a few aniconic symbols, like foot prints, a throne, the Bo tree or stupas, in the prechristian Indian art, Buddhism came to evolve a variety of picturesque representations of a Self-Existent, Super immanent Principle: in myriad forms and emanations that range from the superbly magnificent to sheerly grotesque. Endowed with diverse iconographic attributes, Buddhist deities/saints/demons have grown, over the rolling centuries, into bewildering numbers, legions. Which all, leave alone the neophytes, not even the best of scholars can recognize! 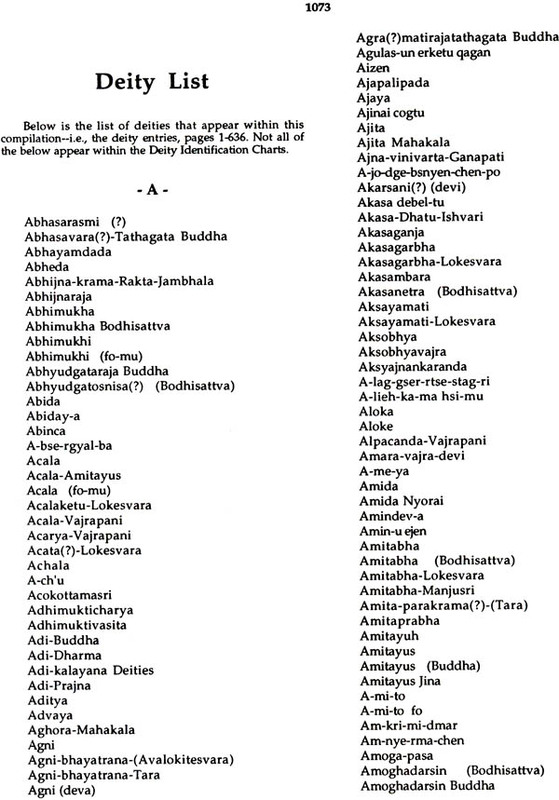 The names of the divinities and their cultural/regional perceptions - owing largely to the plurality of Buddhist pantheons, have only gone on to further complicate their identification. Unveiled, for the first time, in the pages of this Encyclopedia, is a panorama of Buddhist deities, demigods, godlings, saints and demons, with spotlight on the concretized, recognizable forms and the subtle symbolism they involve. 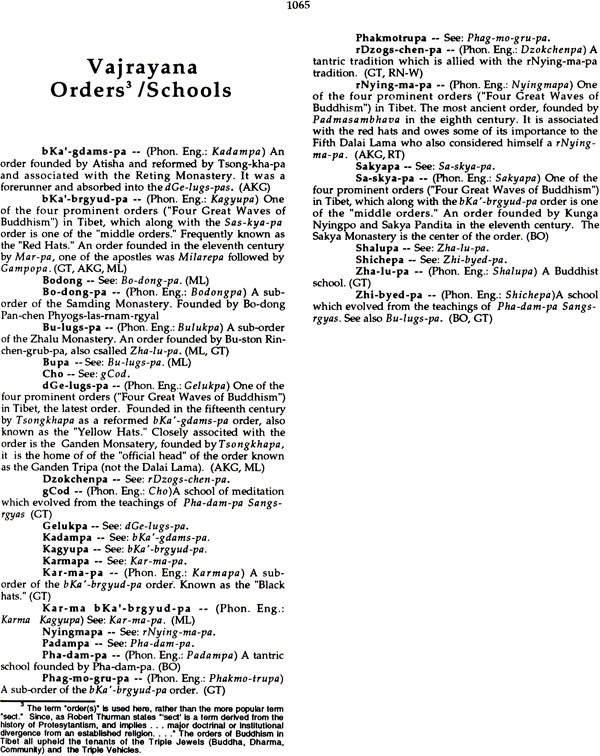 In its nearly 8000 alphabetically arranged articles of varying lengths, it mixes gods and demons, bhiksus and btsans, the aesthetic and the grotesque - in fact, nearly the whole range of good and evil forces which the inspired among the adherents of the Buddhist faith conceived so ingeniously! 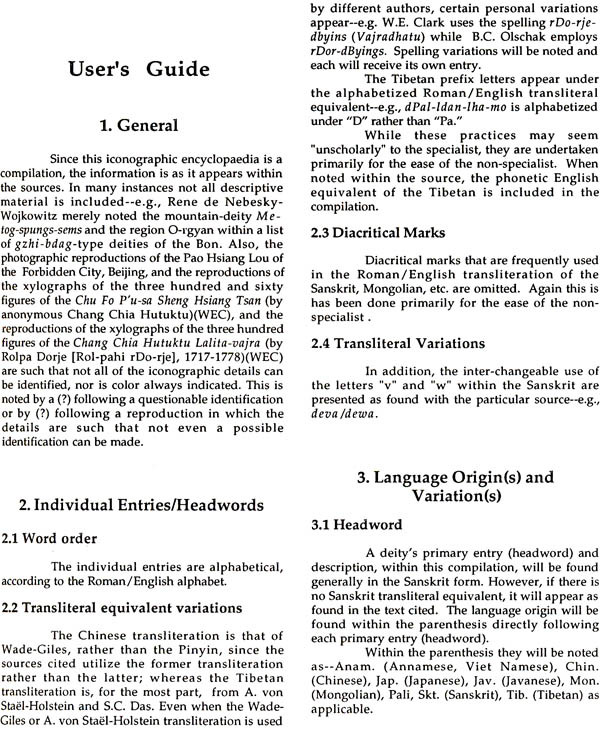 Professor Bunce has painstakingly marshaled a wealth of data from authoritative language sources, notable, Sanskrit, Pali, Tibetan, Newari/Nepalese, Chinese, Mongolian, Japanese, Siamese/Thai, Annamese/Viet Namese, Javanese, and Sinhalese, in his effort to capture almost the entire framework of Buddhist divinities: a multi-pantheonic and hierarchies, ranging from Adi-Buddha to Arhats and yet beyond. Himself a distinguished scholar of Oriental/Buddhist Art, Dr. Bunce incorporates, in scrupulous detail, the iconographic attributes of deities: like colours, heads/eyes, hands, objects held, body, feet, asanas, mudras, ornaments, vahanas, emanations, and whether calm or wrathful - which, with a generous supplement of illustrations: about 300 elegant line-drawings and several colour plates, highlight the distinctiveness of each individual figure. 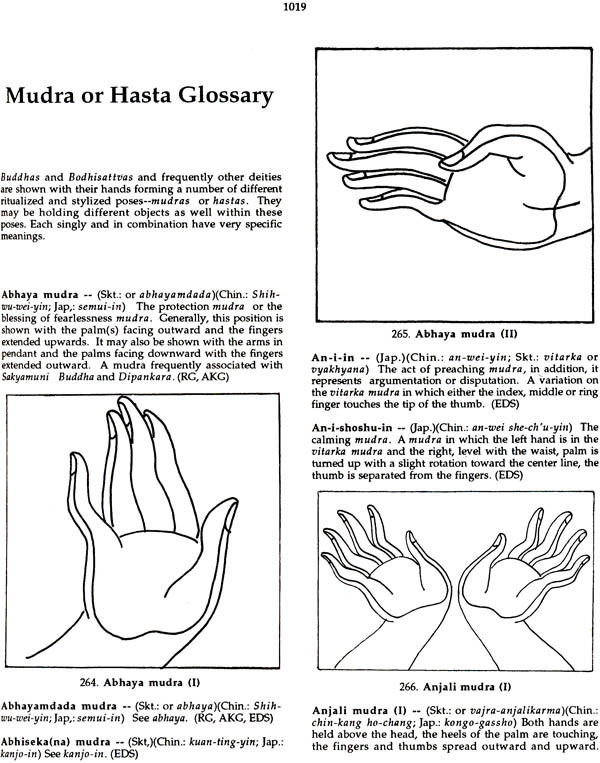 Also included in the Encyclopaedia are user's guide, glossaries (of asanas, mudras and attributes), identification charts, a hierarchic table, and bibliographic references. Growing from years of Professor Bunce's persevered research and study, this compilation is certainly the first ever to draw together most of the Buddhist divinities/ mythological characters, in their distinctly recognizable forms. And is, therefore, indispensable to both the specialists and non-specialists trying to identify each from a whole host of these figural representations. Fredrick W. Bunce, a Ph.D. (Comparative Arts), from the Ohio University, Athens, USA, is a cultural historian of international repute. Professor and former Chair person, Department of Art, Indiana State University, Terre Haute, Indiana, since 1980, he has lectured at learned forums and published on a variety of art-related themes. And has held many a solo exhibition at different art galleries, art museums and universities; besides his participation in the artist's guild/faculty/other ventures of the kind. A scholar with varied intellectual/research concerns-notwithstanding his specializations in Oriental and Buddhist Arts, Professor Bunce has been legitimately honoured with certain notable awards/commendations, and is listed in Who's Who is American Art and also the International Biographical Dictionary: 1980-present. The practices of Buddhism throughout the world, and particularly in the Orient may appear to some to exemplify a faith of paradoxical dimensions. Since its inception, Buddhism has provided the human race with a multitude of thought provoking questions and puzzles as well as elemental and brilliantly clear insights which lase to the very quick of human existence. It is inclusive rather than exclusive and in this lies both its simplicity and complexity. The complexity manifests itself in that no single pantheon exists, rather, there are as many pantheons as there are counties, or internal regions or even sects within regions and/or countries. The progression of deities mount to bewildering numbers, legions. 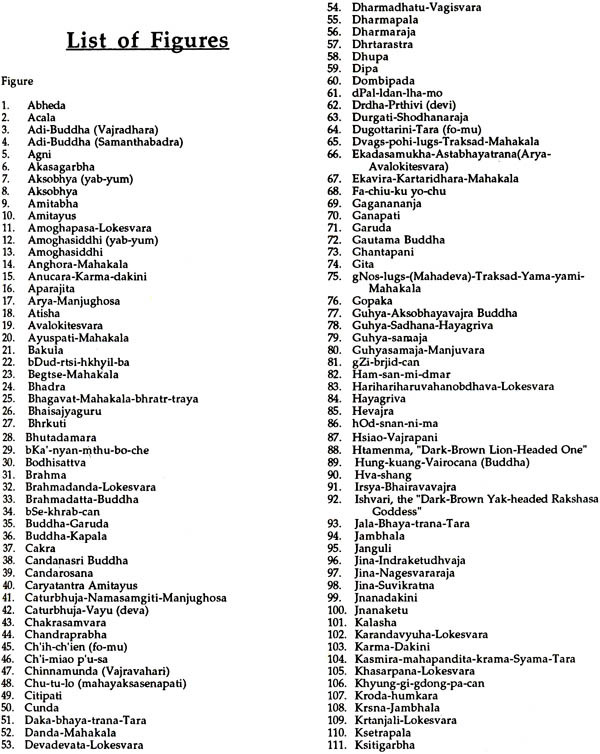 Within Tibetan Vajrayana Buddhist sects alone, it is estimated that there are over twenty-five hundred deities, including their forms and emanations within the various sects. 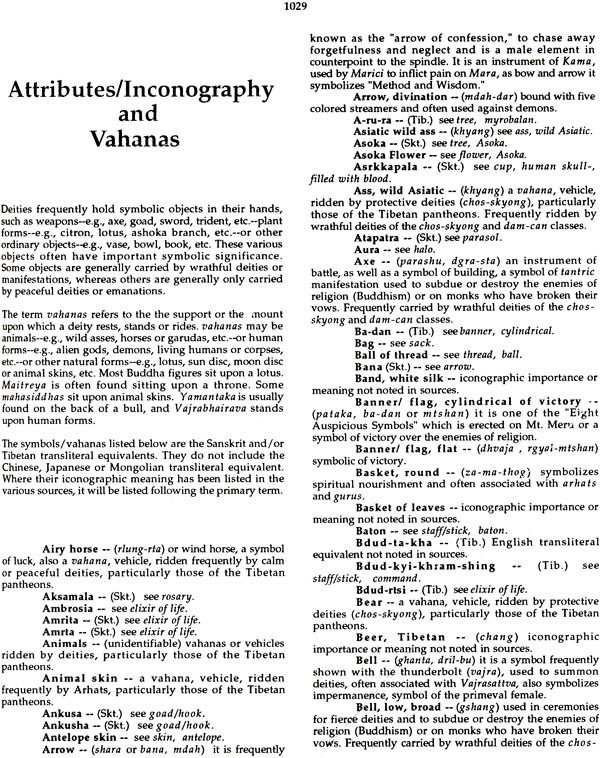 In addition, where one deity may appear in various pantheons the names may differ drastically. Unlike Jesus, or Gesu (Ital. 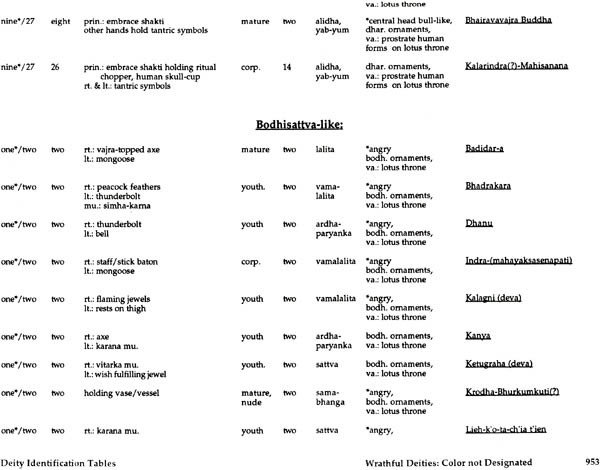 ), or Iesous (Gk. ), or Yeshua (Heb. ), the Bodhisattva Avalokitesvara (Skt. 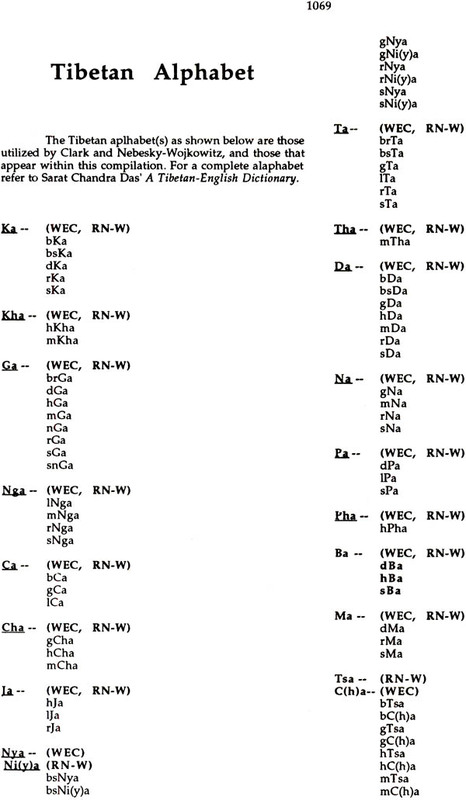 ), "the compassionate one," becomes sPyan-ras-gzigz (phon. Eng. 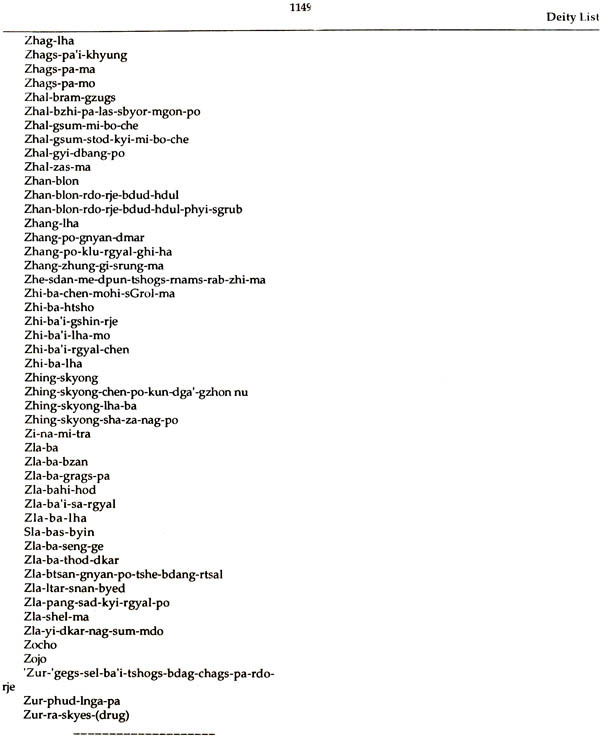 : Chenrezik) or Tibet, Kuan-yin of China, Kwan-ze-on of Japan, or Nidubarujekci of Mongolia. A further complication is noted in that the first two (Avalokitesvara and sPyan-ras-gzigz) are represented as male deities whereas Kuan-yin and Kwan-ze-on are female deities. 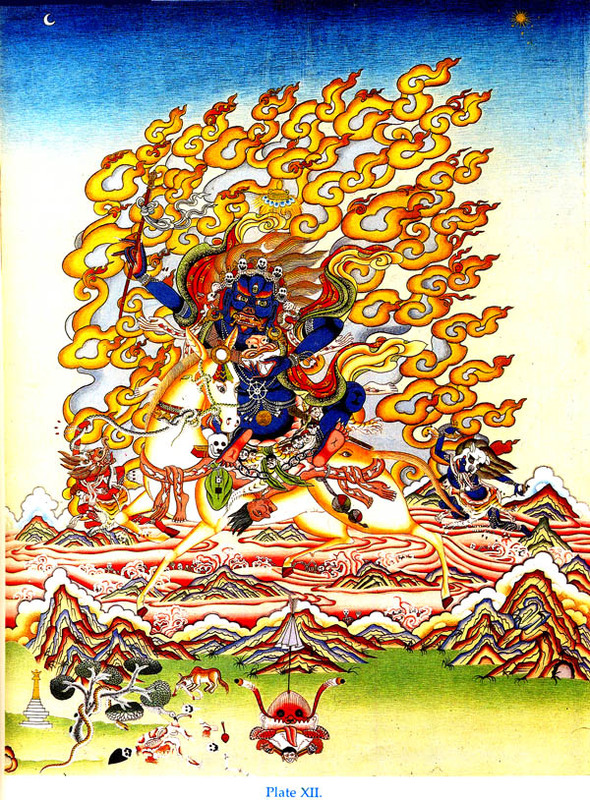 When viewing the visually complex Tibetan or Nepali thangkas, the expressive and sensuous Indian Buddhists figures, the serene Chinese images of the Buddha, the ethereal Sukhothai embodiments, or the bewildering numbers of Bodhisattvas and the myriad forms, it is not unreasonable that a certain amount of confusion may exist as to the proper identification. Certainly, for the neophyte bewilderment may reign. 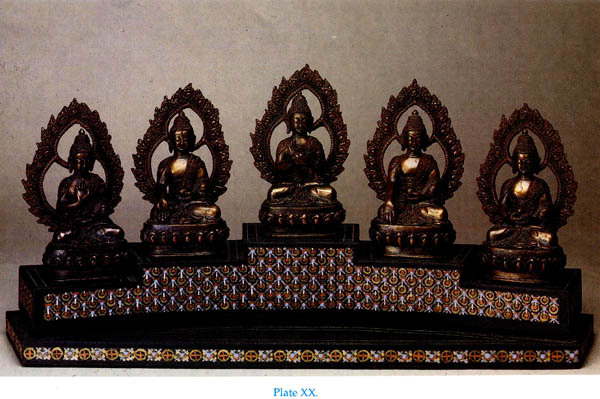 In the Theravada tradition, particularly in Thailand, one is confronted by Buddha images which may be seated, standing, walking or reclining and their hands in a number of different attitudes. Similarly, within even the simplest Tibetan home a number of sacred images usually occupy a prominent position. Not only would you find a major, readily recognizable deity-frequently Sakyamuni Buddha-but also images venerated by one of the many sects, tutelary deities of the region and/or household and frequently an image of an arhat. These are but some of the problems that a person confronts within the varied, broad umbrella of Buddhism. This work has been compiled to assist in the uncovering of some of these complexities and/or identification problems. Of course, there exists a number of highly specialized studies which deal with various aspects of Buddhist deities. One must, at this point, mention the contributions of Benoytosh Bhattacharyya, Dipak Candra Bhattacharyya, Lokesh Chandra, Walter E. Clark, Rene de Nebesky-Wojkowitz and Giuseppe Tucci among many whose studies have been thorough within their specific purviews. The importance of these specialized studies cannot be minimized, however, there does not exist a work whose focus includes the broad spectrum of the various pantheons particularly their attributes/iconography. Therefore, this iconographic encyclopaedia has been compiled primarily to fill that void-to become an aid for the specialist as well as offering an easy access to non-specialists when they are faced with the number of deities and their attendant iconographies. The process in compiling the material contained within this iconographic encyclopaedia proceded from three types of source material. 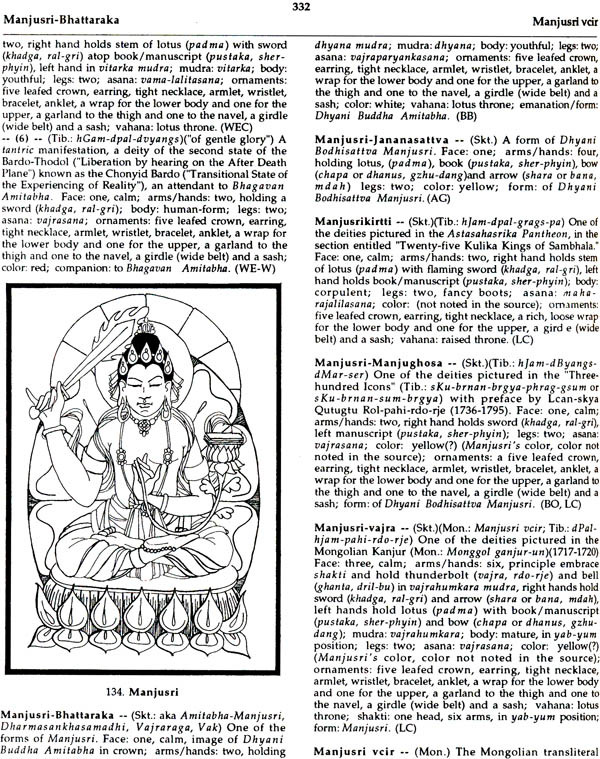 The compilation is primarily a visual analysis of the images from a number of publications/works-e.g., the pantheons found in: Five Hundred Gods of Narthang (c. 1810) (500 deities). The Pao Hasiang Lou temple of the Forbidden City, Beijing (786 deities); the Chu Fo P'u-sa Sheng Hsiang Tsan, by an sKu-brnan-sum-brgya) with preface by Lcan-skya Qutugtu Rol-pahi-rdo-rje (1736-1795) (300 deities); Mongolian Kanjur (Mom. 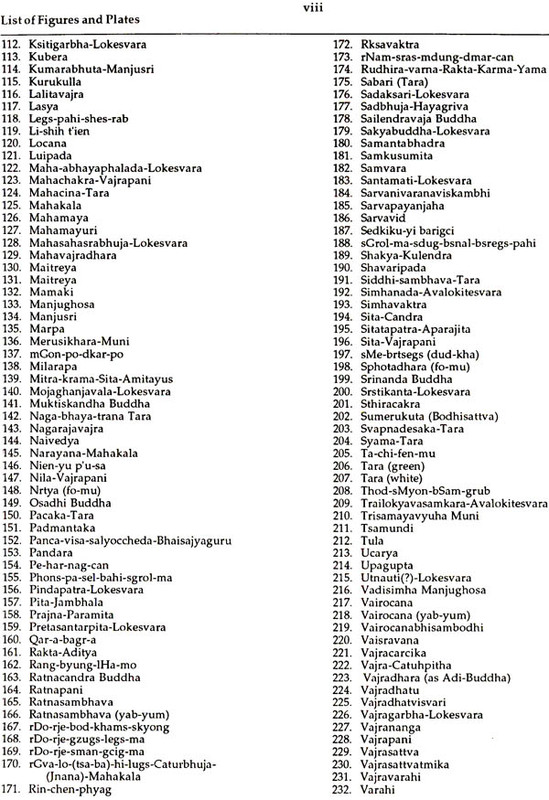 : Monggol ganjur-un) (1717-1720) (756 deities); the Bhadrakalpika-sutra Pantheon (72 deities); and, the Asta-sahasrika Pantheon (1156 deities). 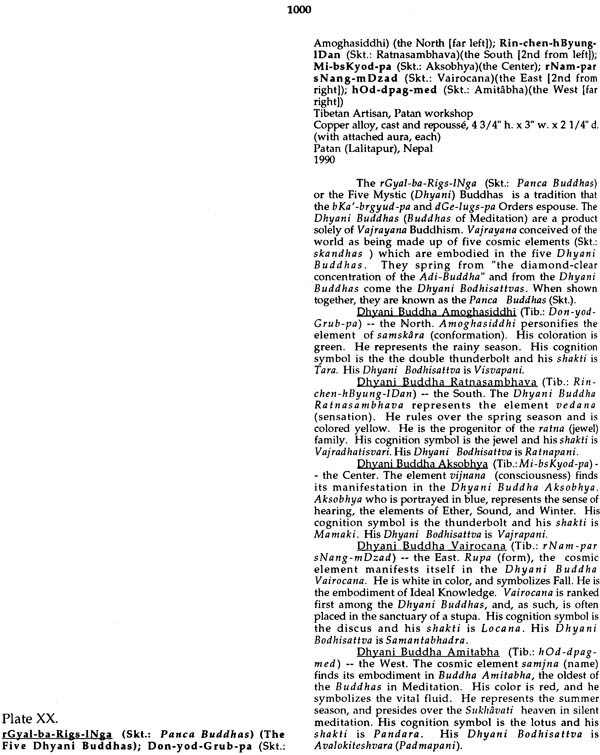 Surely, these visual sources found their genesis in a myriad of written sources, but as Caesare Ripa's Iconocologia was the touchstone for the visual artists of the Baroque (European) period so have these Buddhist "Iconologia" been and are the visual source for Buddhist artists of various periods and locales. 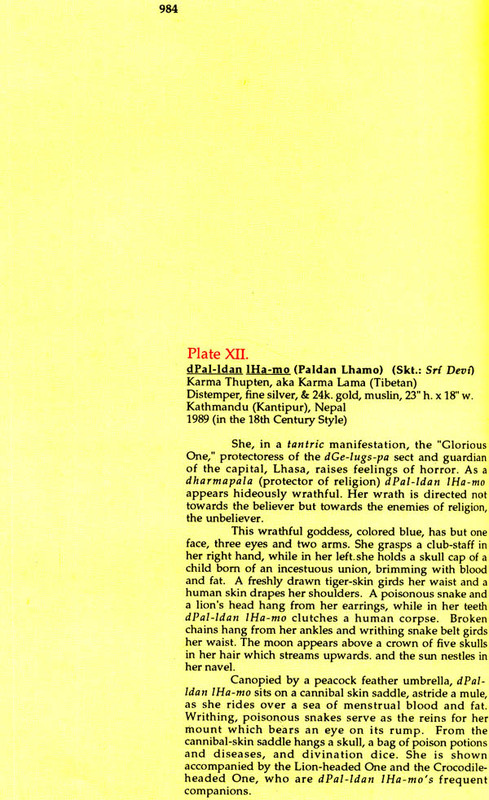 There are also a number of sources in which visual representations do not exist, their descriptions being verbal-e.g., Rene de Nebesky-Wojkowitz's Oracles and Demons of Tibet: The Cult and Iconography of the Tibetan Protective Deities. 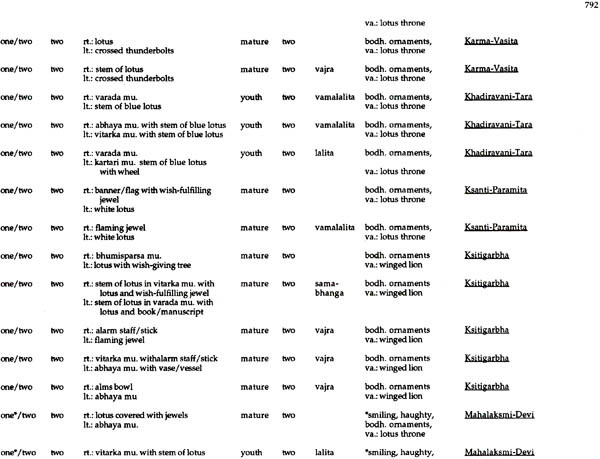 Finally, there are a number of sources in which both verbal and a limited number of illustrations are presented-e.g., Ramesh S. Gupte's Iconography of the Hindus, Buddhists and Jains or Alice Getty's The Gods of Northern Buddhism: Their History, Iconography, and Progressive Evolution through the Northern Buddhist Countries. Due to the material included-the primary entries, the Deity Identification Charts and the Deity List-it was necessary to prepare this endeavour in two volumes. It is anticipated that this division will be of advantage to all. 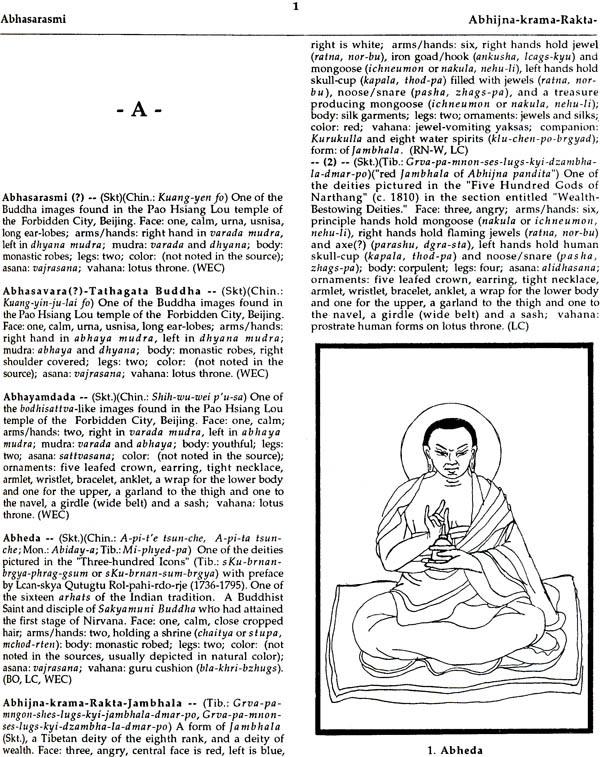 Finally, this iconographic encyclopaedia does not purport to list all the deities, demigods, godlings, "saints" and demons and or their emanations or variation that inhabit the various Buddhist pantheons. However, within this compilation every attempt has been made to include those deities which have been included in the various studies cited-certainly the major deities of the various pantheons are included. The complexity of Buddhist pantheon has necessitated from time to time to have some sort of compendium for proper identification. The Encyclopaedia of Buddhist Deities, Demigods, Godlings, Saints and Demons by Prof. Fredrick W. Bunce is really a monumental accomplishment. 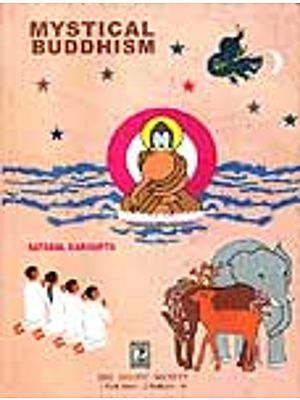 In the pre-Christian centuries the Buddhist thought and philosophy rallied round the personality of the Sakyamuni, his simple teachings, main life events and of course some stories related to his previous births, the Jataka tales. In sculptural art the Master's presence was conveyed through symbols. 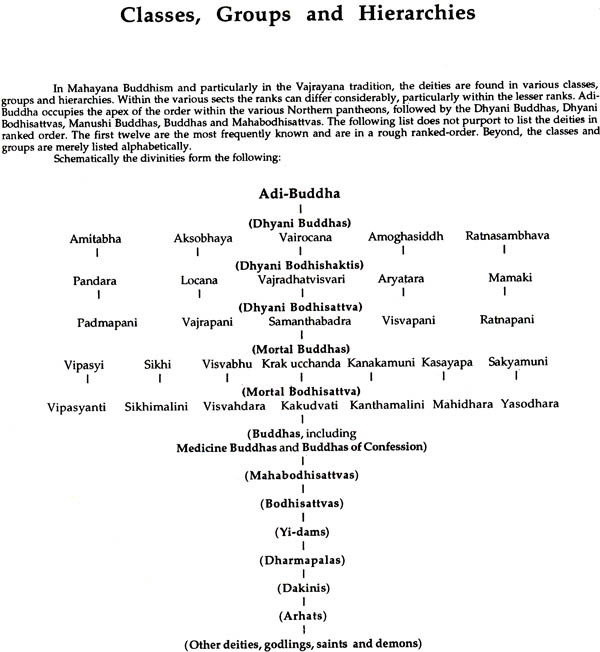 The devotional fervour of a large number of followers, however, did not feel satisfied with abstract representation and the Buddhist Church split into two major folds, viz., Hinayana (large number of worshippers) favouring the human representation of the Buddha. The great schools of art, viz., Mathura and Gandhara evolving and flourishing contemporareously under the patronage of the Kushana king not only presented the ideal form of the Buddha image to be followed in the centuries to come but they also diversified the pantheon in manifolds. The other regional schools in the western and southern parts of the country followed the same trends. With the repeated invasion of barbarous and iconoclastic races and other factors, the process of manifestation almost extinguished in the mainland except in the Eastern India where the Pala and Sena rulers continued to favour Buddhism. The message of the Enlightend One had already crossed the frontiers of India and with the new calamity of attacks and destruction of Buddhist pantheon found a more safe and congenial atmosphere in the neighbouring countries like Nepal and Tibet. The emergence of Vajrayana, a Tantrik version of Mahayana, in the medieval period opened new vistas in Buddhist iconography in which the number of arms, attributes and even heads multiplied. The deity was conceived in cosmic forms. The union of male and female energies was a new mystic formula. Beside stone and metal, paper and cloth were used for paintings and the new media of representation provided ample opportunities to display the valour of artist's brush and devotee's concept and sentiments. Not only the Buddha, Dhyani Buddhas, Avalokitesvaras, demigods, guardian deities, female counterparts, saints and attendants but also demons and evil spirits were represented for ritual practice and the sky was the only limit in fructification of the Buddhist pantheon. The depiction reached the stage of utter complication and confusion and it was felt necessary to provide marks of identification and cognizance. The Silpa texts served this purpose to a great extent. But for modern researchers these treatises also became obscure for several reasons. Some scholars have, therefore, engaged themselves to provide the key to understand this complex iconography. I am glad that Prof. Bunce of Indiana State University has taken a lead in scripting an Encyclopaedia on the subject and he has been assisted in its illustrations by Mr. G.X. Capdi. Prof. Bunce really deserves best compliments and admiration in iconometry such as forms, arms, postures, colors, ornaments, mounts, counterparts or companions, etc. The D.K. Printworld and particularly its Managing Director Sh. K. Rai Mittal is also to be appreciated as he has agreed to bring out this great and ambitious project with utmost care and perfection. I hope this laudable work will be received well in academic world and the researchers in the field of Buddhist studies would find it highly rewarding.